Bovine interferon-γ kit (MCA5638KZZ) used for the determination of interferon-γ in sheep and goat serum samples. Quantification of interferon-gamma (IFN-γ) in serum samples collected from sheep and goats following PPRV infection. 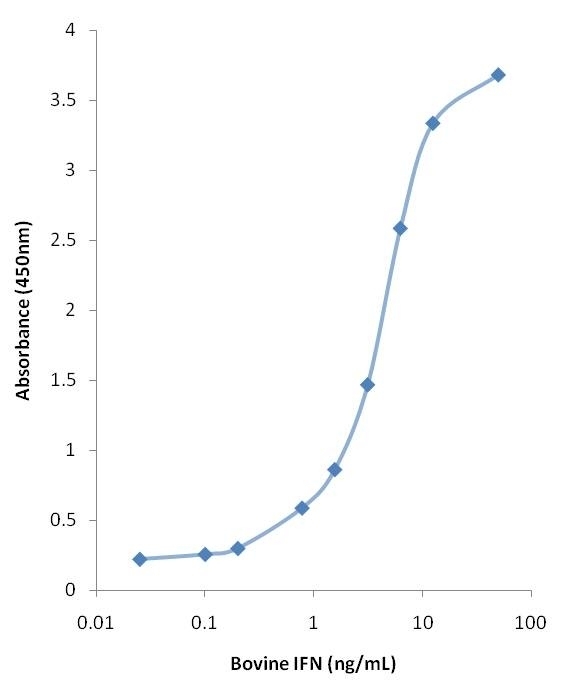 Measurement of IFN-γ levels were performed using an IFN-γ ELISA and cross-reactive antibodies against bovine IFN-γ, and quantified using a standard provided by the manufacturer. Results presented are the mean values with standard deviations from animals at each time point. P<0.05 for goats at 8 dpi compared to −2 dpi by t-test. Peste des Petits Ruminants Virus Tissue Tropism and Pathogenesis in Sheep and Goats following Experimental Infection. Bovine interferon gamma ELISA kit used for the measurement of interferon gamma levels in bronchoalveolar lavage from calves infected with bovine respiratory syncytial virus. Variations of cells populations and cytokines in bronchoalveolar lavage (BAL) from calves challenged with BRSV-Snk. Experimental challenge by inhalation of aerosolized BRSV passaged in gnotobiotic calves (BRSV-Snk) was performed in five calves with moderate levels of BRSV-specific maternal antibodies (MDA). Samples of the cells populating the lower airways were collected via BAL seven days after infection, and in addition, from three healthy uninfected calves (Control). Cells in BAL samples were analyzed by light microscopy (panel A), and expressed as group mean ×106 cells/ml. The concentrations of indicated inflammatory cytokines in BAL sample supernatants were measured using specific ELISAs, and are expressed in ng/ml: (panel B) interleukin (IL)-4; (panel C) IL-6; (panel D) IL-8; (panel E) interferon gamma (IFNγ); and (panel F) tumor necrosis factor alpha (TNFα). Individual data are indicated by rings and group means by horizontal lines. Probability (p) of statistically significant differences between groups is given in each panel, where p ≤ 0.05 was considered statistically significant. A bovine respiratory syncytial virus model with high clinical expression in calves with specific passive immunity. BMC Veterinary Research 2015, 11:76. The Bovine Interferon Gamma Kit is specific for bovine interferon gamma (IFN-gamma), a secreted cytokine involved in anti-viral activity and growth regulation belonging to the type II interferon family. IFN-gamma is produced by lymphocytes in response to activation by specific antigens or mitogens. In addition to its anti-viral activity, IFN-gamma has important immunoregulatory functions in the activation of macrophages and anti-proliferative effects upon transformed cells. Bovine Interferon gamma ELISA KIt (MCA5638KZZ) is an ELISA kit (5 x 96 wells) designed for the quantitive determination of bovine interferon gamma (BoIFN-gamma) in bovine serum, plasma and culture supernatant. This assay can measure BoIFN-gamma in the range 0.025-50 ng/ml in bovine serum, plasma and culture supernatant. Detailed instructions for use of the kit can be found here. This assay is based on a sandwich ELISA using two different mouse anti bovine IFN-gamma monoclonal antibodies and a recombinant bovine IFN-gamma as a standard. Tubes for preparing standard and sample dilutions. Prior to use store all kit components at +4oC. DO NOT FREEZE. Please view the handbook for further details. Storage in frost free freezers is not recommended. This Kit contains components that are photosensitive and should be protected from light. Avoid repeated freezing and thawing as this may denature components within this kit. The contents of this kit should be stored undiluted. Should components within this kit contain a precipitate we recommend microcentrifugation before use. This kit and its components are Research Use Only. Not for Therapeutic or Diagnostic use. Vet Immunol Immunopathol. Aug 15;154: 102-10. Truong, T. et al. 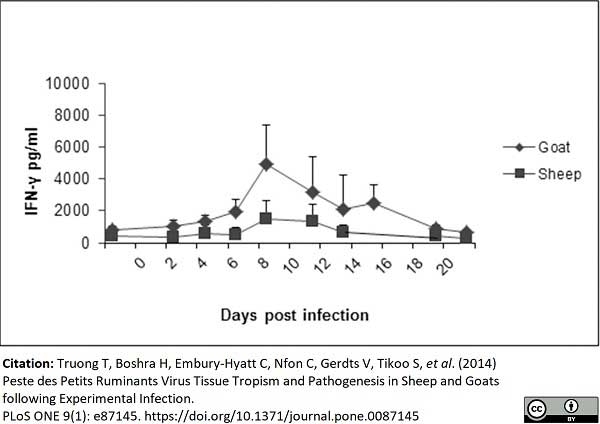 (2014) Peste des petits ruminants virus tissue tropism and pathogenesis in sheep and goats following experimental infection. Blodörn, K. et al. 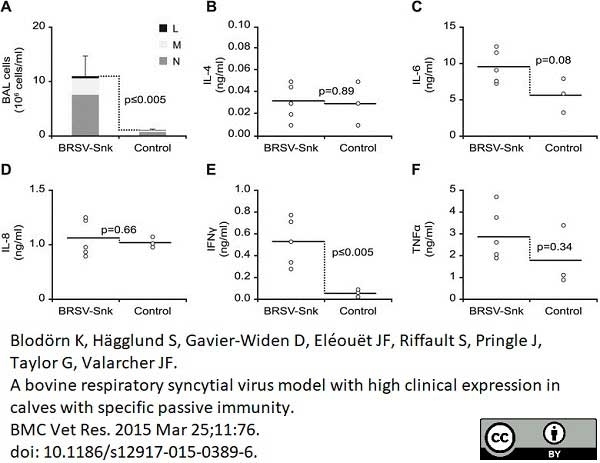 (2015) A bovine respiratory syncytial virus model with high clinical expression in calves with specific passive immunity. BMC Vet Res. 11: 76. Beechler, B.R. et al. (2017) Host immunity, nutrition and coinfection alter longitudinal infection patterns of schistosomes in a free ranging African buffalo population. PLoS Negl Trop Dis. 11 (12): e0006122. Shaw, A.E. et al. (2017) Fundamental properties of the mammalian innate immune system revealed by multispecies comparison of type I interferon responses. PLoS Biol. 15 (12): e2004086. Open Journal of Veterinary Medicine. 06 (07): 105-111.